To strengthen the current bonhomie in the region, Prime Minister Dr Manmohan Singh today launched a new peace initiative with Pakistan, offering a “treaty of peace, security and friendship”. “The peace making process must ultimately culminate in giving a meaning and substance to our quest for shared goals”, he said. commitment to open more such links with neighbouring Pakistan. Should all MPs holding office of profit also resign as Members of Parliament? 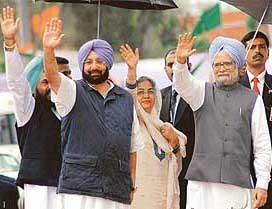 Prime Minister Manmohan Singh today announced sops for Punjab, especially his hometown Amritsar, keeping in view the Assembly elections, scheduled for February next year. These included upgradation of the Attari railway station and the Wagah joint check-post. A total of Rs 570 crore has been announced for the overall development of Amritsar. The construction sector has been hit hard as the cement manufacturing companies, which appear to have formed a cartel, have increased the price of cement by Rs 100 per bag in the past few months. In the retail market, the cement is available at Rs 225-230 per bag while in bulk it is available at Rs 220 per bag. This (Amritsar) is a holy city. A historic city with a great past. An international city whose people reside in all corners of the world. The Delhi High Court today refused to stay the Delhi police “look out” notices against the accused and witnesses in the Jessica Lall murder case. Mr Justice Vikramjit Sen, while hearing the petition of socialite Bina Ramani, in whose restaurant Jessica was shot dead seven years ago allegedly by Manu Sharma, directed the police to submit their reply by April 5 to her petition. In a pre-dawn attack, 200 armed Naxalites today broke open a jail at a town in Gajapati district, 65 km from here, killed three policemen and lost four to five of their own comrades in a gun battle before freeing 40 prisoners, including a few ultras. Samresh Jung let go his chance of winning a record seven gold as he allowed his mind to waver in the 25m centre fire pistol tie-breaker and settled for bronze while Gagan Narang and Abhinav Bindra added to India’s bounty with a thrilling 1-2 finish in the 50m rifle 3 position of the Commonwealth Games shooting competition here today.